Become a Mule Days Volunteer! Each year, more than 700 energetic volunteers from all walks of life, help to make Bishop Mule Days a huge success. 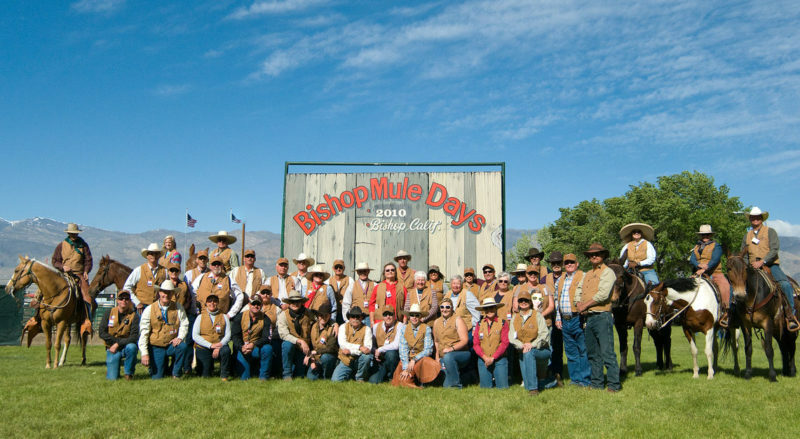 Bishop Mule Days is a non-profit corporation with proceeds given back to local organizations and business community. One way this is accomplished is by contracting with numerous local clubs and service groups to help put on a part of Mule Days. For example, the Lee Vining PTSO staffs the RV lot parking, the Bishop Union High School Dance Team sells souvenirs, the BUHS Cheerleaders collect tickets at the gates, Home Street Middle School controls all traffic and parking, Bishop Little League and BUHS Baseball team convert daily the Charles Brown Auditorium for multiple venues occurring through the week, BUHS Football team helps build all the RV spaces and sell potable water to the RV’s throughout the event, BUHS Volleyball and Softball teams carry banners in the parade, Boy Scout Troop 82 sell souvenir magazine, California High School Rodeo Association District 9 sell souvenir magazines and benefit raffle tickets for a brand new mule trailer, and the First Presbyterian Church cleans the restrooms. All these individuals take personal time to mold the event into a truly community driven, world class event. Bishop Mule Days needs the help of volunteers to continue to produce this wonderful event. If you are interested in becoming a volunteer, there are many opportunities to be involved. Presently, we are in need of chairman or co-chairman in the following areas: Friday Night BBQ, Media Relations, Parade, Parade Detour, Volunteers, and Volunteer Lunches. Help is also needed in the Mule Days office, Barns and Stalls, Volunteer Hospitality, Souvenirs, Souvenir Magazine, Ticket Booth, Concert and Show. For more information or to volunteer, contact us at (760) 872-4263 or by email.